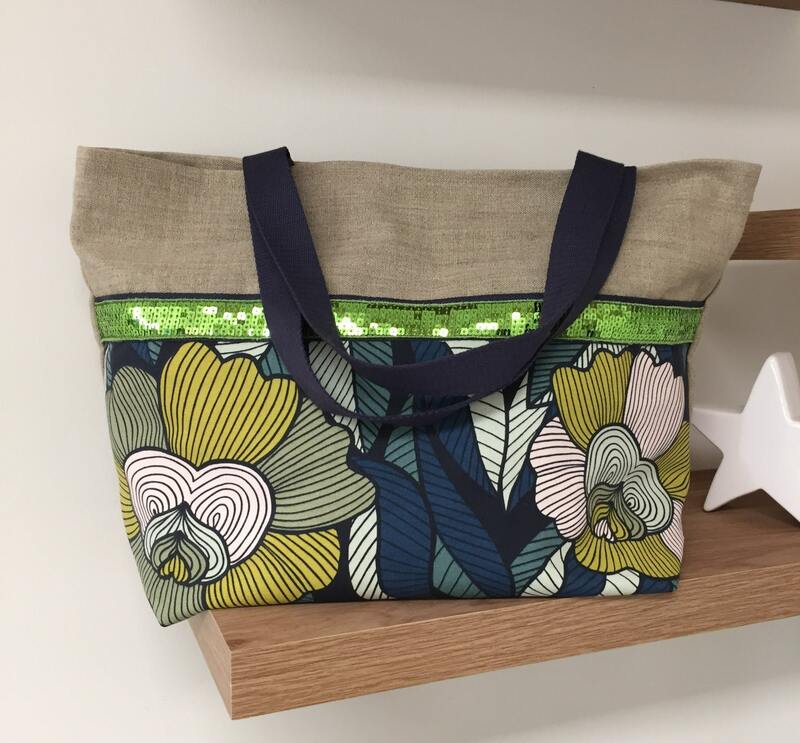 Shopping bag with sequins, large tote bag in linen, colored beach bag, shopping bag in natural linen and big blue and green flowers, decorated with apple green sequins! A practical bag that you can easily wear on your shoulder for a shopping trip, a sunny walk or a trip to the seaside! And because you take the last kid's cuddly toy, the taste of your whole tribe and lots of essential stuff, it must be big enough, but also robust (linen has this essential quality! ), and practical with large handles to carry it on the shoulder! So I designed it in a very beautiful natural linen canvas, which does not deform under the weight of its content, a linen straight from Normandy! It is fully lined with a blue cotton fabric and a large inner zipped pocket in fabric matching the front (20 cm zipped pocket). A silver magnetic button closes the bag opening. It has two handles made of navy blue cotton strap. This bag will be the ideal accessory, robust and trendy! Did you know that? To make this bag, 36 different seams are required! You will receive it with a tracking number, well protected, nicely packaged, and ready to offer!